US official stamps, for use by government offices, were issued between 1873 and 1881. The Act of Congress, approved on March 3, 1873, abolished the franking privilege for government mail and provided for the issue of official postage stamps for each government department. The new US official stamps were issued to government departments on July 1, 1873. The portrait busts and numeral tablets of the new stamps, with the exception of those of the Post Office Department, were identical to the contemporary regular definitive US postage stamps. The outside frames of the stamps varied, and all the stamp denominations for each government department were printed in a single color, unique to that government department. The Treasury Department set is shown in the image above (Sc. #O72-O82). Beginning in 1873, the new official stamps were produced by the Continental Banknote Co. on thin, hard paper, the same as the contemporary definitive US postage stamps. The majority of the listed US official stamps were printed by the Continental Banknote Co.
On February 4, 1879, the Continental Banknote Co. merged with the American Bank Note Co. The official stamps produced by the American Banknote Co. were printed on soft, porous paper. The American Banknote Co. only printed the most commonly used denomination stamps for each department, and they didn't produce any stamps at all for the Executive Department, Navy Department, or the State Department, other than some 1881 special printings, which were all overprinted "SPECIMEN". As a result of this limited output, some of the American Banknote Co. printings are very rare. Special printings were made of all the US official stamps by the Continental Banknote Co. during 1875 and by the American Banknote Co. during 1881. These special printings were made at the same time the other rare postage stamp reprints, re-issues, and special printings were produced. All of the special printings of the US official stamps are overprinted "SPECIMEN", as shown in the examples above. 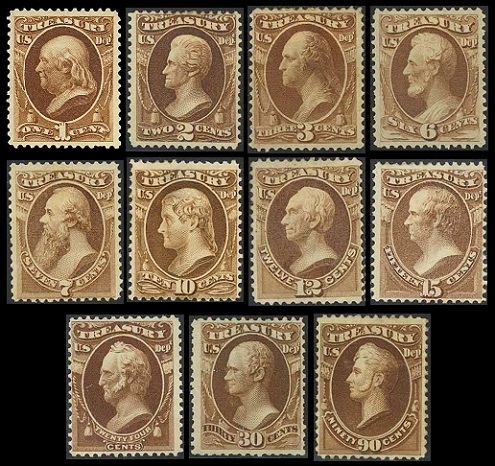 These special printings are listed in the Scott catalog, following the listings for the regular US official stamps. Where many of the lower denomination official stamps, produced in large quantities, are reasonably affordable, the higher denomination official stamps, produced in very small quantities, are difficult to obtain, and they are very expensive today. All of the official stamps produced for the Agriculture Department are printed in YELLOW (shades: yellow, golden yellow, olive yellow). An example of the 1 C. denomination is shown above. Here are the catalog details for the Agriculture Department -- 1873 Continental Banknote Co. printing on thin, hard paper. 01 C. (1873 - Sc. #O1) - Benjamin Franklin - Yellow. 02 C. (1873 - Sc. #O2) - Andrew Jackson - Yellow. 03 C. (1873 - Sc. #O3) - George Washington - Yellow. 06 C. (1873 - Sc. #O4) - Abraham Lincoln - Yellow. 10 C. (1873 - Sc. #O5) - Thomas Jefferson - Yellow. 12 C. (1873 - Sc. #O6) - Henry Clay - Yellow. 15 C. (1873 - Sc. #O7) - Daniel Webster - Yellow. 24 C. (1873 - Sc. #O8) - Winfield Scott - Yellow. 30 C. (1873 - Sc. #O9) - Alexander Hamilton - Yellow. Here are the catalog details for the Agriculture Department -- 1879 American Banknote Co. printing on soft, porous paper. 01 C. (1879 - Sc. #O94) - Benjamin Franklin - Yellow. 03 C. (1879 - Sc. #O95) - George Washington - Yellow. All of the official stamps produced for the Executive Department are printed in CARMINE (shades: carmine, pale carmine, deep carmine). An example of the 1 C. denomination is shown above. Here are the catalog details for the Executive Department -- 1873 Continental Banknote Co. printing on thin, hard paper. 01 C. (1873 - Sc. #O10) - Benjamin Franklin - Carmine. 02 C. (1873 - Sc. #O11) - Andrew Jackson - Carmine. 03 C. (1873 - Sc. #O12) - George Washington - Carmine, Violet Rose. 06 C. (1873 - Sc. #O13) - Abraham Lincoln - Carmine. 10 C. (1873 - Sc. #O14) - Thomas Jefferson - Carmine. All of the official stamps produced for the Interior Department are printed in VERMILION (shades: vermilion, dull vermilion, bright vermilion). An example of the 1 C. denomination is shown above. Here are the catalog details for the Interior Department -- 1873 Continental Banknote Co. printing on thin, hard paper. 01 C. (1873 - Sc. #O15) - Benjamin Franklin - Vermilion. 02 C. (1873 - Sc. #O16) - Andrew Jackson - Vermilion. 03 C. (1873 - Sc. #O17) - George Washington - Vermilion. 06 C. (1873 - Sc. #O18) - Abraham Lincoln - Vermilion. 10 C. (1873 - Sc. #O19) - Thomas Jefferson - Vermilion. 12 C. (1873 - Sc. #O20) - Henry Clay - Vermilion. 15 C. (1873 - Sc. #O21) - Daniel Webster - Vermilion. 24 C. (1873 - Sc. #O22) - Winfield Scott - Vermilion. 30 C. (1873 - Sc. #O23) - Alexander Hamilton - Vermilion. 90 C. (1873 - Sc. #O24) - Commodore Perry - Vermilion. Here are the catalog details for the Interior Department -- 1879 American Banknote Co. printing on soft, porous paper. 01 C. (1879 - Sc. #O96) - Benjamin Franklin - Vermilion. 02 C. (1879 - Sc. #O97) - Andrew Jackson - Vermilion. 03 C. (1879 - Sc. #O98) - George Washington - Vermilion. 06 C. (1879 - Sc. #O99) - Abraham Lincoln - Vermilion. 10 C. (1879 - Sc. #O100) - Thomas Jefferson - Vermilion. 12 C. (1879 - Sc. #O101) - Henry Clay - Vermilion. 15 C. (1879 - Sc. #O102) - Daniel Webster - Vermilion. 24 C. (1879 - Sc. #O103) - Winfield Scott - Vermilion. All of the official stamps produced for the Justice Department are printed in PURPLE (shades: purple, dark purple, bluish purple). An example of the 1 C. denomination is shown above. Here are the catalog details for the Justice Department -- 1873 Continental Banknote Co. printing on thin, hard paper. 01 C. (1873 - Sc. #O25) - Benjamin Franklin - Purple. 02 C. (1873 - Sc. #O26) - Andrew Jackson - Purple. 03 C. (1873 - Sc. #O27) - George Washington - Purple. 06 C. (1873 - Sc. #O28) - Abraham Lincoln - Purple. 10 C. (1873 - Sc. #O29) - Thomas Jefferson - Purple. 12 C. (1873 - Sc. #O30) - Henry Clay - Purple. 15 C. (1873 - Sc. #O31) - Daniel Webster - Purple. 24 C. (1873 - Sc. #O32) - Winfield Scott - Purple. 30 C. (1873 - Sc. #O33) - Alexander Hamilton - Purple. 90 C. (1873 - Sc. #O34) - Commodore Perry - Purple. Here are the catalog details for the Justice Department -- 1879 American Banknote Co. printing on soft, porous paper. 03 C. (1879 - Sc. #O106) - George Washington - Purple. 06 C. (1879 - Sc. #O107) - Abraham Lincoln - Purple. All of the official stamps produced for the Navy Department are printed in ULTRAMARINE (shades: ultramarine, bright ultramarine, dark ultramarine) or DULL BLUE. An example of the 1 C. denomination is shown above. Here are the catalog details for the Navy Department -- 1873 Continental Banknote Co. printing on thin, hard paper. 01 C. (1873 - Sc. #O35) - Benjamin Franklin - Ultramarine, Dull Blue. 02 C. (1873 - Sc. #O36) - Andrew Jackson - Ultramarine, Dull Blue. 03 C. (1873 - Sc. #O37) - George Washington - Ultramarine, Dull Blue. 06 C. (1873 - Sc. #O38) - Abraham Lincoln - Ultramarine, Dull Blue. 07 C. (1873 - Sc. #O39) - Edwin M. Stanton - Ultramarine, Dull Blue. 10 C. (1873 - Sc. #O40) - Thomas Jefferson - Ultramarine, Dull Blue. 12 C. (1873 - Sc. #O41) - Henry Clay - Ultramarine, Dull Blue. 15 C. (1873 - Sc. #O42) - Daniel Webster - Ultramarine, Dull Blue. 24 C. (1873 - Sc. #O43) - Winfield Scott - Ultramarine, Dull Blue. 30 C. (1873 - Sc. #O44) - Alexander Hamilton - Ultramarine. 90 C. (1873 - Sc. #O45) - Commodore Perry - Ultramarine. All of the official stamps produced for the Post Office Department are printed in BLACK. An example of the 1 C. denomination is shown above. Here are the catalog details for the Post Office Department -- 1873 Continental Banknote Co. printing on thin, hard paper. 01 C. (1873 - Sc. #O47) - Numeral - Black. 02 C. (1873 - Sc. #O48) - Numeral - Black. 03 C. (1873 - Sc. #O49) - Numeral - Black. 06 C. (1873 - Sc. #O50) - Numeral - Black. 10 C. (1873 - Sc. #O51) - Numeral - Black. 12 C. (1873 - Sc. #O52) - Numeral - Black. 15 C. (1873 - Sc. #O53) - Numeral - Black. 24 C. (1873 - Sc. #O54) - Numeral - Black. 30 C. (1873 - Sc. #O55) - Numeral - Black. 90 C. (1873 - Sc. #O56) - Numeral - Black. Here are the catalog details for the Post Office Department -- 1879 American Banknote Co. printing on soft, porous paper. 03 C. (1873 - Sc. #O108) - Numeral - Black. All of the official stamps produced for the State Department are printed in DARK GREEN (shades: green, bright green, dark green, yellowish green). An example of the 1 C. denomination is shown above. Here are the catalog details for the State Department -- 1873 Continental Banknote Co. printing on thin, hard paper. 01 C. (1873 - Sc. #O57) - Benjamin Franklin - Dark Green. 02 C. (1873 - Sc. #O58) - Andrew Jackson - Dark Green. 03 C. (1873 - Sc. #O59) - George Washington - Dark Green. 06 C. (1873 - Sc. #O60) - Abraham Lincoln - Dark Green. 07 C. (1873 - Sc. #O61) - Edwin M. Stanton - Dark Green. 10 C. (1873 - Sc. #O62) - Thomas Jefferson - Dark Green. 12 C. (1873 - Sc. #O63) - Henry Clay - Dark Green. 15 C. (1873 - Sc. #O64) - Daniel Webster - Dark Green. 24 C. (1873 - Sc. #O65) - Winfield Scott - Dark Green. 30 C. (1873 - Sc. #O66) - Alexander Hamilton - Dark Green. 90 C. (1873 - Sc. #O67) - Commodore Perry - Dark Green. All of the official stamps produced for the Treasury Department are printed in BROWN (shades: brown, dark brown, yellowish brown). An example of the 1 C. denomination is shown above. Here are the catalog details for the Treasury Department -- 1873 Continental Banknote Co. printing on thin, hard paper. 01 C. (1873 - Sc. #O72) - Benjamin Franklin - Brown. 02 C. (1873 - Sc. #O73) - Andrew Jackson - Brown. 03 C. (1873 - Sc. #O74) - George Washington - Brown. 06 C. (1873 - Sc. #O75) - Abraham Lincoln - Brown. 07 C. (1873 - Sc. #O76) - Edwin M. Stanton - Brown. 10 C. (1873 - Sc. #O77) - Thomas Jefferson - Brown. 12 C. (1873 - Sc. #O78) - Henry Clay - Brown. 15 C. (1873 - Sc. #O79) - Daniel Webster - Brown. 24 C. (1873 - Sc. #O80) - Winfield Scott - Brown. 30 C. (1873 - Sc. #O81) - Alexander Hamilton - Brown. 90 C. (1873 - Sc. #O82) - Commodore Perry - Brown. Here are the catalog details for the Treasury Department -- 1879 American Banknote Co. printing on soft, porous paper. 03 C. (1879 - Sc. #O109) - George Washington - Brown. 06 C. (1879 - Sc. #O110) - Abraham Lincoln - Brown. 10 C. (1879 - Sc. #O111) - Thomas Jefferson - Brown. 30 C. (1879 - Sc. #O112) - Alexander Hamilton - Brown. 90 C. (1879 - Sc. #O113) - Commodore Perry - Brown. All of the official stamps produced for the War Department are printed in ROSE (shades: rose, pale rose, rose red). An example of the 1 C. denomination is shown above. Here are the catalog details for the War Department -- 1873 Continental Banknote Co. printing on thin, hard paper. 01 C. (1873 - Sc. #O83) - Benjamin Franklin - Rose. 02 C. (1873 - Sc. #O84) - Andrew Jackson - Rose. 03 C. (1873 - Sc. #O85) - George Washington - Rose. 06 C. (1873 - Sc. #O86) - Abraham Lincoln - Rose. 07 C. (1873 - Sc. #O87) - Edwin M. Stanton - Rose. 10 C. (1873 - Sc. #O88) - Thomas Jefferson - Rose. 12 C. (1873 - Sc. #O89) - Henry Clay - Rose. 15 C. (1873 - Sc. #O90) - Daniel Webster - Rose. 24 C. (1873 - Sc. #O91) - Winfield Scott - Rose. 30 C. (1873 - Sc. #O92) - Alexander Hamilton - Rose. 90 C. (1873 - Sc. #O93) - Commodore Perry - Rose. Here are the catalog details for the War Department -- 1879 American Banknote Co. printing on soft, porous paper. 01 C. (1879 - Sc. #O114) - Benjamin Franklin - Rose. 02 C. (1879 - Sc. #O115) - Andrew Jackson - Rose. 03 C. (1879 - Sc. #O116) - George Washington - Rose. 06 C. (1879 - Sc. #O117) - Abraham Lincoln - Rose. 10 C. (1879 - Sc. #O118) - Thomas Jefferson - Rose. 12 C. (1879 - Sc. #O119) - Henry Clay - Rose. 30 C. (1879 - Sc. #O120) - Alexander Hamilton - Rose. On May 1, 1879, US official stamps were replaced by penalty envelopes, and on July 5, 1884 these postage stamps were declared obsolete. These lovely stamps were only in use about six years, and today, they are very popular with US stamp collectors. A collection of these stamps can result in an incredibly stunning display, and a specialized study of these stamps could turn into a lifetime philatelic endeavor by itself. Besides the 120 sheet-format stamps originally issued, there are essays, die proofs, plate proofs, trial-color proofs in various colors, and a whole range of postal stationery items. Many of these collateral philatelic items are actually far less expensive than the original stamp issues themselves! The first multiple-dollar denomination postage stamps produced for the U.S. Government were printed by the Continental Banknote Co. in 1873, for use by the State Department. The four very-large-format, multiple-dollar denomination State Department postage stamps shown above feature the portrait of William H. Seward. William H. Seward (1801-1872) was a former New York Congressman and the Secretary of State of the United States from 1861 to 1869, serving during both the Abraham Lincoln and Andrew Johnson administrations. He is best remembered for negotiating the purchase of the Alaska Territory from the Russian Empire in 1867. The vignettes of these stamps were printed in black, while the frames were printed in green, dark green, or yellowish green. The Two Dollar denomination stamp (Sc. #O68) is readily available in the philatelic marketplace, though it can be a bit expensive. The Five Dollar, Ten Dollar, and Twenty Dollar denomination stamps (Sc. #O69-O71) are very rare and seldom available in the philatelic marketplace. Examples of them occasionally appear in major public auction sales.